First either create a new category, from the top menu "Create Category" or navigate into an existing category. Second, click on the "Add Keywords" button if the form is not yet open. ***You must select the corresponding language with the appropriate region if you decide to track a different Google region. 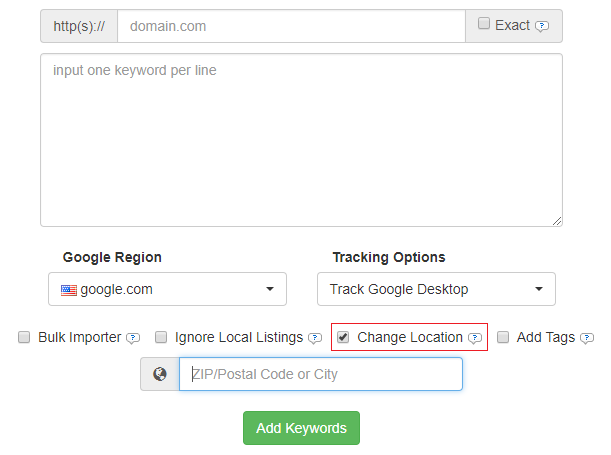 Ticking off the "Change Location" checkbox will force SerpBook to check your keyword from your desired ZIP code/location. This should be used if you plan on checking keywords that rely on local traffic (i.e. "dentist" with a search location of Toronto). For example, if you depend on traffic or want to search from a specific location like a certain Zip Code, this option would be best for you. Click here for more details about changing location. 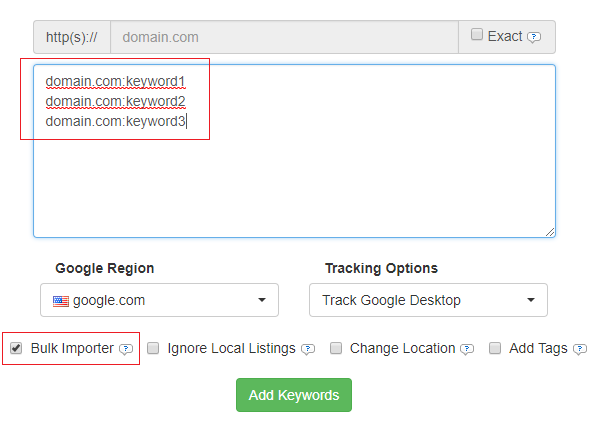 Multiple domains/keywords can be added in using the "Bulk Importer" feature. 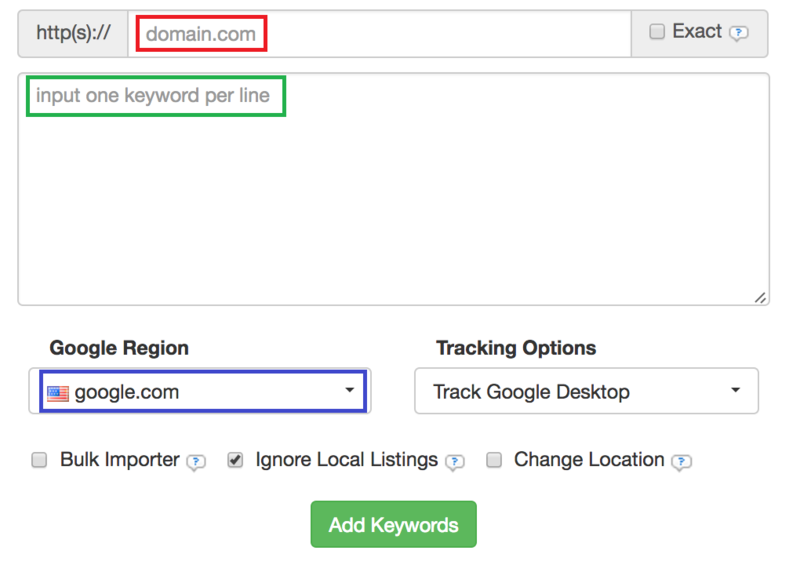 Once this option is ticked, you can add in your domains/keywords in the format "domain.com:keyword" (one per line). Click here for more details regarding Bulk Importer. 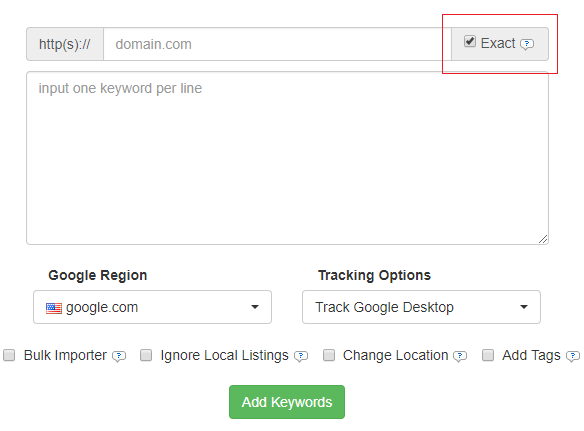 Ticking off the "Exact" checkbox will force SerpBook to only report back your inputted URL. Otherwise SerpBook will report back the first ranking URL it finds by default (read more). Ticking off the "Ignore Local Listings" checkbox will force SerpBook to ignore Google Places/Local listings. 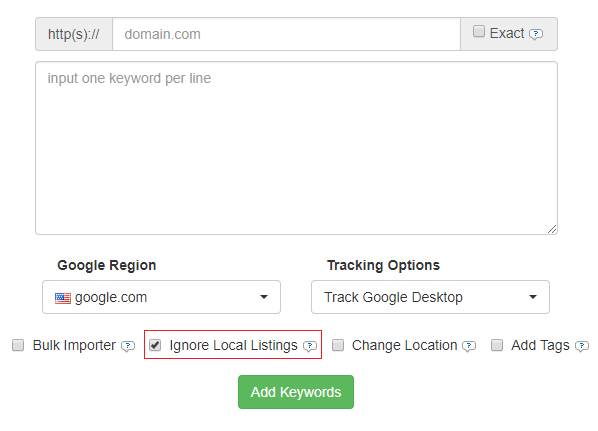 Click here for more details in tracking keywords on a local level.